Welcome Markussw, I know of the tool you speak of. I used one when I was in school learning to do the work with wood. Not the right answer I'm looking for. Monday I will give the correct answer. I have one more: It's a tool you can fix "block"(? )-letters with to have an (die) stamp. Wether used with ink like old gutenberg ones' or heated for f.e. wood. 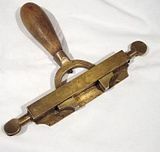 A bookbinder's blocking press is what this tool is known to be. Because it's made of brass I would speculate it was heated and used for heat embossing leather book bindings. 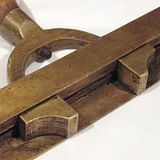 A press which heats blocks and impresses lettering. designs, etc., into the covers of books. Markussw gave it his best last guess and it was the correct one that I was looking for. Very well done Marckus. There were many good gueses by others, well done to you all. Markuss, send me an address in a PM so I can send you your stove.